You can’t stop looking at it. It’s so dang sparkly and who knew your ring finger could get such a work out from carrying around that rock all day! 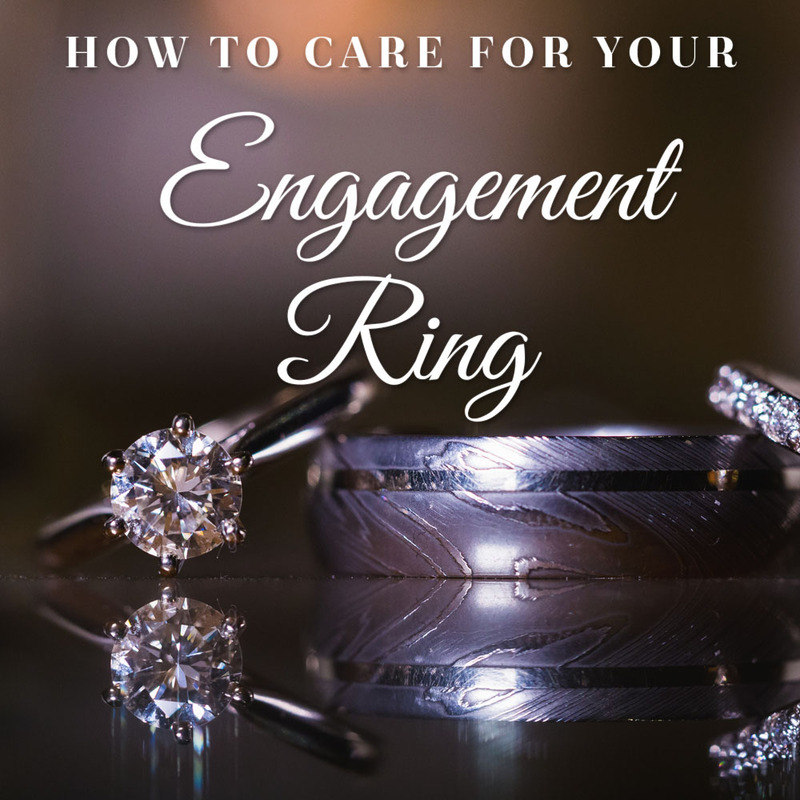 While your ring is made of metal and stone, remember that your engagement ring is still a fragile piece of jewelry and should be treated with care. While some cleaning solutions might be great for diamonds, they could be too harsh for other metals or stones that your ring is made up of. Here’s what jewelry experts recommend: Clean your ring often using gentle dish soap (like Dawn), warm water and a soft bristle toothbrush that’s reserved specifically for your ring. Remember to stay away from or plug the drain when you clean it so that you don’t accidentally drop it down! Use a gentle dabbing (not scrubbing!) motion to clean crevices and carefully remove dirt/oils. Scrubbing could potentially cause scratches, so remember to be gentle! Once you’re done carefully rinse your ring and dry with a lint free cloth. While gentle home cleaning can keep your ring shiny, it’s not enough. Be sure to have your ring professionally inspected and cleaned regularly to ensure no stones are loose, prongs are bent and nothing is cracked. Any professional jewelers or jewelry store should be able to do a proper inspection and make repairs. That shiny new ring on your finger is a future family heirloom. The love it represents is priceless, but those precious metals and stones are pretty expensive too. Having insurance is a great place to start to ensure that your ring is protected in the event it’s lost or stolen. Along the same line of thought, you’ll want to make sure to get your ring appraised every few years. The price of metals and precious stones can change by a lot in just a few years time, so keeping your appraisals up to date will ensure that you have the appropriate amount of insurance coverage on your ring so you’re not stuck getting only its partial value if you ever have to file a claim. Lotions, hairspray, bleach, furniture polish and hair dye are just a few things that can cause discoloration and leave your ring dull and sometimes even permanently damaged. Make sure to always remove your ring before you use any of these products, just to be safe. Take off your ring while cooking. This is especially important when you’re working with raw meats, making meatballs or cookie dough. Bacteria can get caught inside the grooves of your ring and well it goes without saying that that’s pretty gross! Another time you’re better off tucking your ring into a safe place is while exercising. Cold water while swimming can shrink your fingers, making it easy for your ring to slip off. On the other hand, heavy lifting can put strain on the band, eventually stretching it which can lead to loose stones that can fall out and get lost. When you’re not wearing your ring, make sure you have a safe place for it. A good quality ring box is the safest place to store it until you put it back on! Most of all don’t forget what your ring represents! It’s a symbol of your love and promise to each other. It’s a family heirloom in the making. What are your favorite tips for keeping your ring sparkling and clean? Share in the comments!